Why would you need Captain Jerry and Wendy Taylor? Unsure of your ability to outfit and operate your just purchased trawler? Are you anxious about the confidence level of your spouse? Do you need to satisfy the experience requirements requested by your insurance company? Are you searching for a comfortable, enjoyable, natural way to gain confidence and experience aboard your trawler? Are you searching for a training experience that uses a manual to provide the opportunity for future anytime reference? Are you comfortable with engine room trouble-shooting, maintenance and management, including identifying spare parts requirements, procurement, inventory and stowage? Any or all of the above? Then TaylorMade Trawlering is for you. We will share with you our experience of over 35 years and 250,000 sea miles travelled, the equivalent of ten times around the globe. These miles have been covered on a wide variety of vessels, many of which have been single engine trawlers. You will gain confidence and experience with hands-on instruction on board your own vessel, eliminating ‘big boat intimidation’ and creating a ‘comfort Zone’ with regards to close quarters boat handling and docking. You will learn in modular sessions aimed at building your confidence, developing your boat handling skills and stressing the importance of safety, preparation and maintenance. You will complete your personalized vessel operations manual. Where and When Can You Do It? 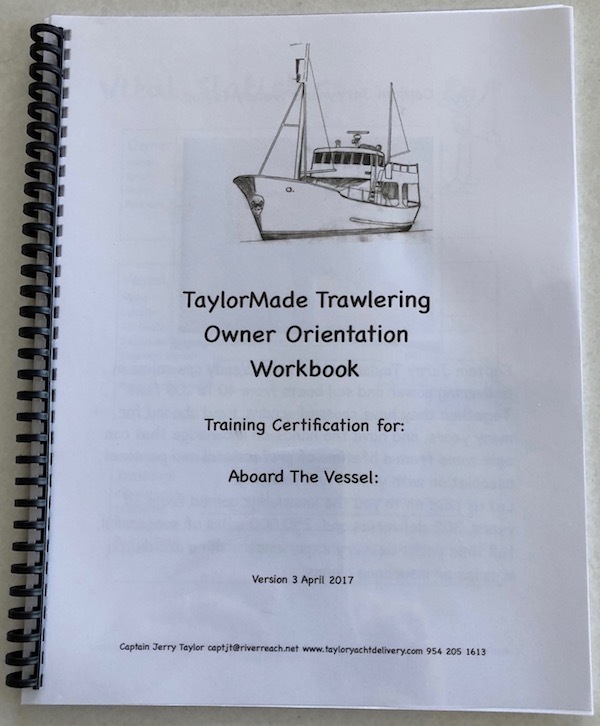 We will train you on board your vessel, whether you need an introduction to trawlering, a brush up on boat handling, help preparing for a cruise or assistance in solving problems. You will learn in familiar, comfortable surroundings, on your schedule and in the location of your choice. What areas are covered in the three day training course? We offer a flat rate that includes three days of training using our training manual, our hotel accommodation and our per diem food charge. Costs for travel time and expenses to and from the boat are additional. You will be surprised at how affordable our hands-on training and skilled assistance can be. Compared to the cost of boating without the skills training and knowledge required for safe and fun trawlering, the cost can truly be an investment in your peace of mind and well-being for years to come. We can’t begin our training until insurance issues are satisfied. Can you help with this? We can generate a work list using the survey and recommendations made from our 35 years of experience. With your input this list will be prioritized and vendors suggested. We will complete any tasks within our comfort level and oversee the remainder. We charge by the hour for this service. Can my training be combined with my vessel’s delivery? No, we have found that training during the frequently rigorous process of getting your boat to it’s destination is ineffective. Training should take place in basic segments, in one location, with attention focused on systems, maintenance, up close boat handling and safety requirements. “Not bragging, just reporting on the great training from you two in Stuart …..
“Jerry and Wendy Taylor possess a vast amount of knowledge …..
“It is hard to imagine we have cruised over 2300 miles during the last …..
“Jerry and Wendy, just wanted to say hi and thank you again for your great help in preparing us to handle our beautiful boat …..
“Hands down the best investment I have ever made in all my boating years …..
“Last year Wrightsville Beach, this year Clearwater Beach! We have come a long way and still think of you and how much you …..